Hydrilla forms in dense colonies and can grow to the surface in over 20 feet of water. Hydrilla branches profusely and after reaching the surface it extends across it forming thick mats. The leaves are blade-like about 1/8 inch and 3/8 inch long with small tooth margins and spines on the underside of the midrib which make them feel rough. 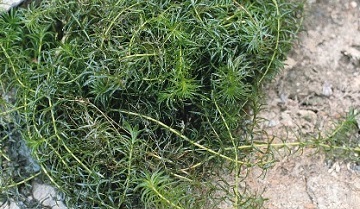 There are typically 4–8 leaves per whorl.Hydrilla is often confused with the native Elodea or the non-native Egeria. Hydrilla has one or more teeth on the underside of the midrib, neither Elodea nor Egeria have these midrib teeth. The teeth make Hydrilla feel rough when drawn through your hand from base to tip. Flowers of Hydrilla are much smaller (1/4 inch in diameter) than Egeria. California, Arizona, Gulf States and Southeastern states up to Washington, D.C.
Hydrilla can reproduce from seeds, fragments, tubers, and turions (axillary buds). Avoid transfer of Hydrilla from boat bottoms and other means of transfer. It is considered harmful to native species. Dibrox® and Spritflo® herbicides are effective at combatting Hydrilla.